One of my closest matches on GedMatch that I could not figure out. Excitement about discoveries should never cause us to forget what we know and to put aside reasoning and analysis. 99.9 cM shared with a descendant of my 3rd great-grandparents (Sartorius) and my 4th great-grandparents (Tjark Fecht). 70.1 cM shared with a descendant of my 4th great-grandparents Thomas and Christianna Rampley. DNAPainter suggested that this person matched matches in my maternal group assigned to my great-grandparents. 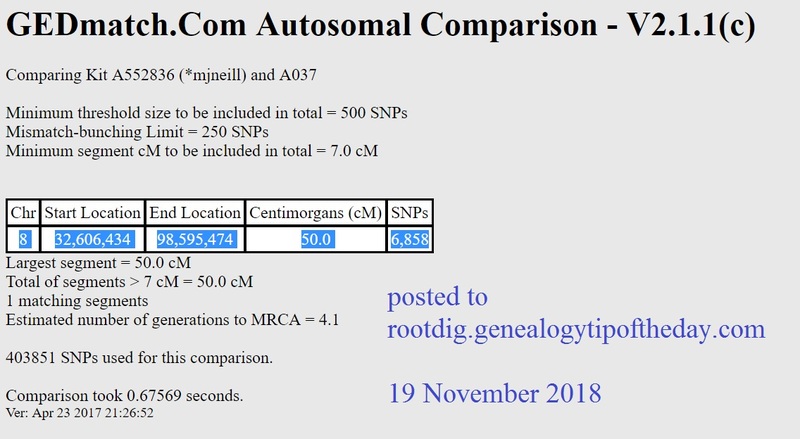 GedMatch allowed me to perform an autosomal comparison and see where this match and I shared DNA. It was on the 8th chromosome–all 50 cM of it. Even though I didn’t know how I was related to this person I decided to paste the shared data into DNAPainter (using the shared chromosomal information as obtained from GedMatch) to see if it was in any of the groups to which I’ve already assigned sections of my DNA on DNAPainter. The 50 cM had some overlap with members of the group that I had assigned to my great-grandparents, Fred and Tena Ufkes. 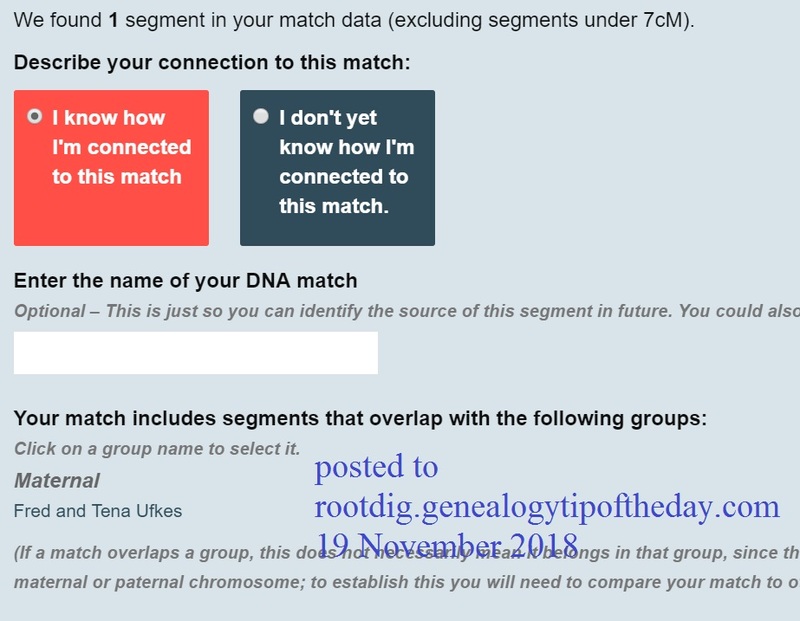 I cancelled out of the upload into DNAPainter as I only assign shared DNA to groups in DNAPainter when I know the genealogical connection to the DNA match. Since I didn’t know how I connected to this person with whom I shared 50 cM of DNA I did not assign it to any group. 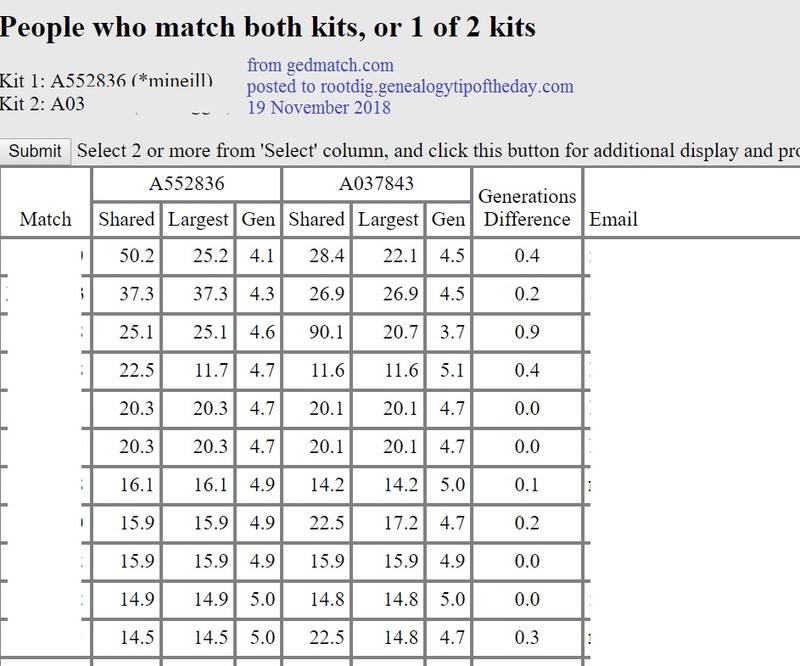 Chromosomes come in pairs and shared match segments as given in GedMatch (and other sites) do not indicate whether they are the individual strand in the pair that comes from the mother or the father. Determining that is up to the researcher and requires analysis–sometimes more than others. The 50 shared cM of DNA that I share with this person could come from my maternal strand or my paternal strand of that 8th chromosome. At this point I don’t know, but I suspect. According to the “Shared Centimorgan Project,” sharing 50 cM of DNA probably puts me in relationship cluster 7 or 8 with this person. That would suggest that we are, roughly speaking, probably between second and third cousins. I remembered having emailed the person a while back and we could not establish any potential connection. That’s really strange for someone who is one of my maternal relatives as they were all 18th century immigrants from the same little area of Ostfriesland to Hancock and Adams Counties in Illinois. 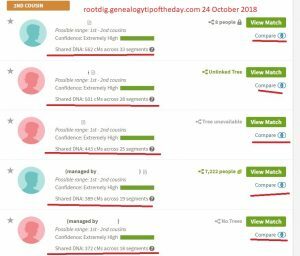 The submitter had posted a GEDCOM file on GedMatch and in reviewing that pedigree chart for the submitter, it became clear she was not a maternal match to me–or at least not very likely. 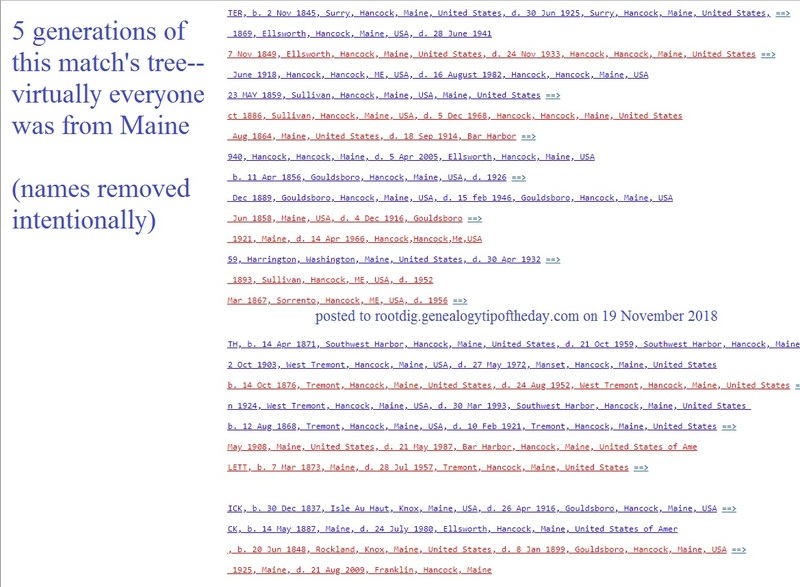 The tree contained at least five generations of ancestors from the state of Maine. I’m not certain any Ostfriesen immigrants ever settled in Maine. While that’s not evidence by any stretch of the definition, it was very suggestive that this match was not on my maternal side. I then decided to look on GedMatch at the shared matches I have with this person with whom I have 50 shared cM of DNA. A grandson of Fred and Tena Ufkes has also tested and he was not a shared match with this person. None of the shared matches were for other Ostfriesen relatives I have identified as GedMatch matches. Based on this I concluded that this person is a paternal match and not a maternal one. The shared matches part of my argument is stronger than the “tree” argument, but the two lines of thought reach a consistent conclusion. In my notes on this match, I should indicate why I concluded that it was a paternal match. Charles Neill–born in the 1870s in Hancock County, Illinois, son of Irish immigrants. Fannie Rampley–born in the 1880s with known ancestry in Virginia, Maryland, and Kentucky–and probably no further north. It’s possible Fannie’s family is the connection. George Trautvetter–grandson of German immigrants to the US in the 1840s/1850s. Likely not the connection. Ida’s family is essentially from New York State and most of New England when traced back to approximately 1800. It seems most likely that she’s the one who connects to someone in the state of Maine. Further comparison of matches needs to be done. But my reasoning needs to be written down and tracked somewhere. Leaving my analysis only in my head is just asking to forget it. Join me for my webinar on problem-solving with GedMatch and DNAPainter. Following your logic was very helpful, thank you.